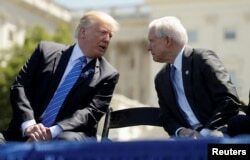 FILE - President Donald Trump speaks with Attorney General Jeff Sessions as they attend the National Peace Officers Memorial Service on the West Lawn of the U.S. Capitol in Washington. FILE - The Idaho Correctional Center south of Boise, Idaho, is operated by Corrections Corporation of America, June 15, 2010. The Obama administration was phasing out its relationships with private prisons. 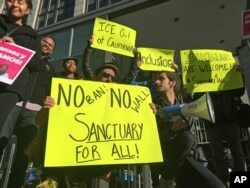 FILE - Protesters hold up signs outside a courthouse where a federal judge hears arguments in a lawsuit challenging President Donald Trump's executive order to withhold funding from communities that limit cooperation with immigration authorities, in San Francisco. 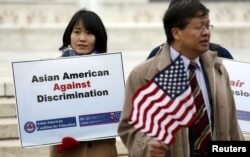 FILE - Asian-American demonstrators rally outside the U.S. Supreme Court as it was hearing a case involving affirmative action in university admissions, Dec. 9, 2015.